Violent clashes between police and striking miners at the Lonmin mine at Marikana in North-West Province, and between members of rival unions, have left 34 dead (at the last count) and many more injured. This has shocked most people in South Africa. 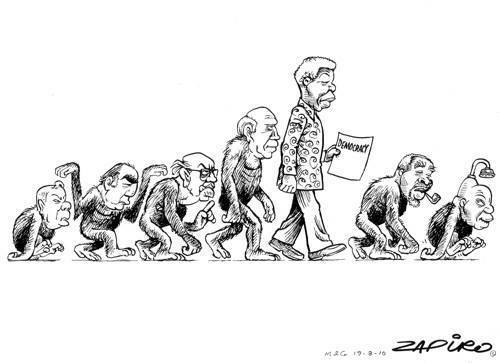 After 18 years of talk of transformation, can we say that anything as been transformed from the old South Africa? Are the police that shot striking miners at Marikana in 2012 any better than those who shot protesters against the pass laws at Sharpeville in 1960? What has been transformed? In such circumstances it’s all to easy to join the blame game. Who are the good guys and who are the bad guys in all this? But the more you learn about what happened and is happening there, the more you realize that it’s not at all simple. There are no good guys and bad guys. There’s good and bad in all. So before pronouncing judgement, it is wise to learn a bit more about the issues and what is at stake, and what led to the strike. One fairly good article on this topic is here: Daily Maverick – Beyond the chaos at Marikana: The search for the real issues. I’m sure that it doesn’t tell the full story, and things have moved on since then, and much of it has been overtaken by subsequent events, but it is worth reading anyway. Can this be compared with Sharpeville? Yes and no. The Sharpeville protesters were unarmed, and most were shot in the back; the Marikana strikers were armed, though most with “traditional weapons”. One can hope that there will be a Commission of Inquiry, and that it will not suffer the same constraints as the Sharpeville one. The miners, we are told, are striking because they want an increase from R4000 a month to R12500 a month. How does R4000 a month compare with 1960? Back then, when we decimalised our currency, and exchanged pounds shillings and pence for Rands and cents, underground miners used to earn between 15c and 35c a shift. That was roughly about R4.00 a month. If they are earning R4000 a month, that is 1000 times more. Of course back then the Rand was worth a lot more than it is now. Again, at a rough guiess, I’d say it was worth 100 times more. A Rand today is worth what a cent was worth back then. In 1961 an omelet and chips in a downtown Joburg restaurasnt cost 35c, as did a plate of mince and rice. You’d be lucky to get the equivalent for R35.00 today. A bottle of Coke or Fanta or Sparletta cost 5c, as did a cup of coffee or a daily newspaper. You’d be lucky to get any of those for R5.00 today. A hamburger cost 15c — equivalent to the daily pay of the lowest paid miners at the time (the miners did get food in the hostels). So if you multiplied the pay by 100 it would be R400 a month today, not R4000. But I don’t know if the miners of today who are earning R4000 a month are still getting free board and lodging. And even those who got free board and lodging on the job back then often had families at home elsewhere. So if they had a wife and three children, they could feed themselves on a quarter of a hamburger each per day. So are the miners justified in striking? Are they justified in aerming themselves? Are they justified in killing those they regard as scabs? Are the police justified in shooting them? I don’t know. If such questions are to be answered, let a judicial Commission of Inquiry look into it. But there are some things about this that do seem more unequivocally bad — people who are not directly involved trying to cash in and make political capital out of it. For example, there’s one of those photos doing the rounds on Facebook, which is both disingenuous and malicious. The farmers were killed by criminals; the miners were killed by the police who are supposed to be catching the criminals. The miners were killed on one day; the farmers were killed over a long period. If one is going to make a thing about occupational groups, then one might as well acknowledge that the criminals picked on the farmers because the thought they were rich; the miners killed by the police were striking because they were poor. So that picture is intended to spread disinformation, and to encourage the uninformed to spread disinformation. 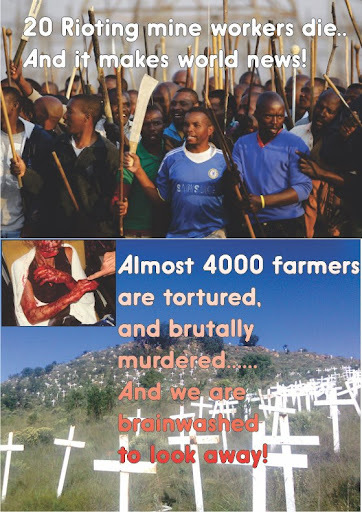 It’s not that murdering farmers is not a bad thing, but rather that those who are ostensibly campaigning against it are trying to promote their cause by using thoroughly dishonest pictures like the one above. Julius Malema wasn’t pulling punches, when he spoke to several thousand Marikana mineworkers on Saturday. President Jacob Zuma should step down, he said, as should Police Minister Nathi Mthethwa. Julius Malema seems to see this as his ticket out of the political wilderness. The pettiness of the refusal of the government to give a visa to the Dalai Lama to stop two old men having a party puts us back to square one. “Isn’t it ironic, that when he’s celebrating his 80th birthday, the most fundamental right — the right to association — is being taken away from him? “He can’t have a party with his friends and they are just old men,” Ramphele said on Monday evening at a candlelight vigil outside Parliament to put pressure on the government to grant the visa. That’s exactly the kind of petty nastiness one had come to expect from the National Party government. And it’s worse, because our constitution now upholds the rights to freedom of religion, freedom of travel, and freedom of association — all of which are trashed by this act. The old National Party was not as cynically hypocritical as that. They made no bones about it — any foreign religious leader was a persona non grata, and found it very difficult to get a visa. And any Nobel Peace Prize winner, domestic or foreign, was the same, and so the combination would not have much hope. I suggest that any Southern African religious bodies hosting international conferences to which foreign religious leaders may be invited should seriously think of moving the venue to Botswana or Namibia, or they may find that their speakers are unable to attend. That would include the congress of the Southern African Missiological Society, due to be held in January 2012. The petty spitefulness of stopping two pensioners having a party, however, is overshadowed by the implications for South African sovereignty. Zuma, who was elected ANC leader by promising to be all things to all men and courting universal popularity, is now finding that popularity gurgling down the drain, and trying to shore it up by disciplinary hearings of his most vociferous critics, but not daring to contradict his (and our) colonial masters. As a student I sometimes enjoyed listening to Radio Peking (as it was spelt in those days), denouncing US imperialism as “a paper tiger, a bean curd tiger”. But Chinese imperialism seems to be lapping up South Africa like bean curd. The Dalai Lama visited South Africa when Nelson Mandela was president, and again when Thabo Mbeki was president. Why not now? And above all, why stop him from coming to Desmond Tutu’s brithday party? 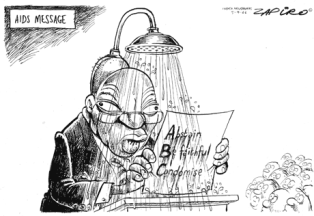 Yesterday was the inauguration of the fourth president of South Africa since the advent of democracy in 1994. According to some reports, the bash cost R75 million. All the TV news channels were reporting it non-stop. In the midst of them showing the chairs being arranged and the like, there was one of those ticker-tape things at the bottom of the screen with a fleeting mention of a train crash in which 100 people had been killed, or something. We waited for more news, but there was no chance of it. The preparations for the inauguration were everything, nothing else mattered. But when Thabo Mbeki was inaugurated in 1999, we stated home, and looked at bits of it on TV. Kgalema Motlanthe was inaugurated without a big fuss being made, and perhaps Jacob Zuma could have had a more low key affair as well. So, bored with the chair-placing by chair-placing account of the inauguration preparations, I switched to a Brit TV station. They might not tell us about a train crash in our own city, but they could perhaps show us something more interesting thatn a bunch of overpaid politicians with umbrellas. Once, South Africa dominated the nightly news for weeks on end. Now the liberal media barely mention it. Why not? Because post-apartheid South Africa is a failure. Well, welcome to the world of failed states, Mr Hitchens. Oh, and it turned out that the train smash wasn’t so serious either, but they could have told us. This just about sums it up completely.